Founded in 2009 by a troupe of players already boiled hard across the Finnish scene, Humangod has been building their name with a desire to create “metal music by absorbing progressive elements while maintaining total freedom of creativity”. However one wishes to interpret that, prog metal is the name of the game in the classical and very melodic vein that primarily reminds me of long-term power houses such as Shadow Gallery and Symphony X. Listening through their second promo Dead Water, first off one has to pay attention to the band’s very evident and sizeable ambition. Two tracks, both clocking slightly above 10 minutes, wham bam thank you ma’m. The time at hand is not wasted either, as both the title track and Behind Words feature a dynamic maelstrom of dizzying instrumental chops combined with a definite knack for riffery, rhythmics and melody. Although the amounts of notes may on occasion border decency, there’s never an unhinged feeling of self-serving widdlyness around. I feel that some would disagree with my claims that this remains tasteful throughout but then sue me. I can really dig the whole packages from the metallic churning to the soothing acoustic moments and every quirky trick in between. On top of the stellar playing, singer Janne Kauppi shows a nifty range from somber clean vocals to higher wailing. Some may find his tone in the full-force-moments too nasally or somehow iffy but again, get those legal documents hot for I find no fault in it. A quality voice that I can’t quickly compare to any renowned singer is a relative rarity and a delightful one at that. 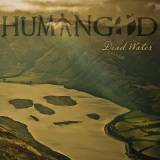 Based on Dead Water, Humangod is easily ready for a full-length release. I would love to hear what kind of a set these guys would assemble if they had for example a 45-60 minute album to work with. All fans of tha prog’ness are advised to check these guys out, pronto.